There couldn’t be a greater contrast to the New England style idyllic prettiness of Niagara- on-the-lake than the mighty Niagara Falls. Just 20 minutes drive down the picturesque Parkway road which hugs the glacier green Niagara river, we come to quite a different tourist destination. Still no 5 in the world’s most visited attractions list, the Falls straddle the border between the USA and Canada and spill about six million cubic feet of water every single minute. We stayed on the 17th floor of the South Tower of the Hilton Hotel and were beyond excited to have a view of the American Falls from our window. We especially didn’t draw the curtains at night so it was the first thing we saw when we woke up! With over 22 million visitors a year Niagara is not the tallest waterfall in the world but it is very powerful and it is a much more accessible site than most with a whole tourist town growing up around it. Today there is a lot of the more family attraction theme park about it, especially in the Clifton Hill area with Ripley’s Believe it or Not, Dracula’s castle and a million t shirt and candy shops lining the sidewalk (American for pavement) The giant Sky wheel looks fun though and I won’t have a word said against the Dinosaur crazy golf course which boasts a life size T Rex and a substantial plastic volcano which belched lava and real flames into the humid Canadian summer afternoon. Crowds throng to the walkway overlooking the Falls, and there must be thousands of pictures taken of them, and people in front of them every day. There are lots of water based acivites too, the Maid of the Mist takes you right up close. 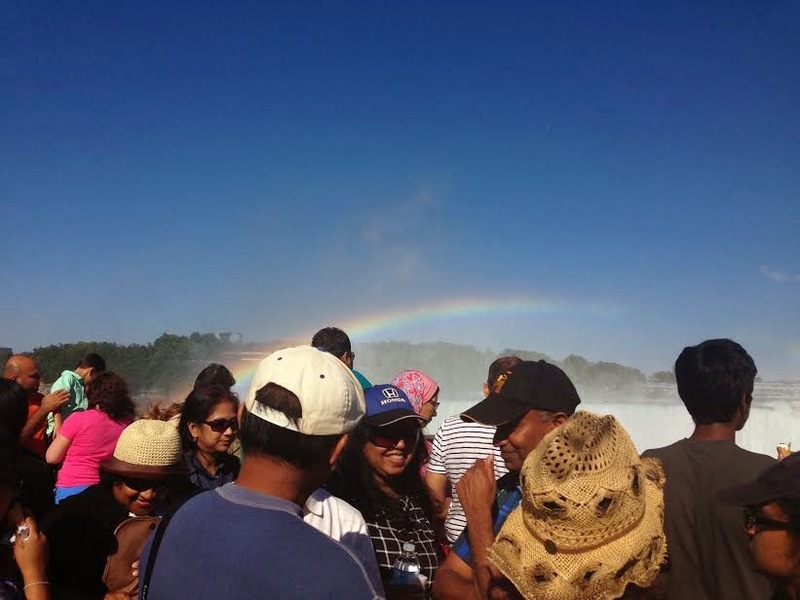 Journey behind the Falls takes you beneath the rushing torrent and the new this year Hornblower cruises are cool too. The power of the Falls has been used to generate electricity for over a hundred years and there are still a number of power stations along their route, some of which are now decommissioned and the municipal council are currently deciding how best to make use of the empty buildings. But there’s more to Niagara than the Maid of the Mist boat ride (although this is jolly too) and a no brainer photo opportunity. Niagara is a place with not inconsiderable historical significance. Just a twenty minute walk away from the hustle and bustle of Clifton Hill (or a couple of stops on the WEGO bus) you will find the Niagara Falls History Museum. Housing a vast collection of this area’s history, the museum recently underwent a $12m renovation and is a fascinating place to spend a couple of hours. There’s an exhibition dedicated to the bloody battle of 1812 where Britain fought against the US (apparently the native Americans were on our side) As a colony of Great Britain, Canada got caught up in things and suffered a few invasions. There was also an exhibition dedicated to the history of the motel – a real icon of Americana. A motel (shortened from motor hotel) referred initially to a single story building where the doors face the parking lot for the convenience of the motorist. As the provincial highways began to develop in the 1920’s long distance road journeys became more common and the need for inexpensive, easily accessible accommodation next to main routes grew. Often privately owned (as was the most famous motel – the Bates Motel) they reached their peak in popularity in the 60’s but then were overtaken by the rise of the chain hotels. North Americans do love their cars. The museum has reconstructed a motel room with framed quotes from real Niagara honeymooners recalling motel tales such as how they struggled to get to sleep on a wobbly water bed. The other thing we really wanted to do was to see the hotel room that Marilyn stayed in when she was filming Niagara here in 1952. We were surprised that more wasn’t made of this connection in the town as she is such a global movie icon, but it’s all pretty low key. The actual hotel is still there although it was called the General Brock back then, and is now the Crowne Plaza. Her room was originally a suite with a cracking view of the Falls but it is now divided into two ordinary rooms 801 and 802 and construction in front of the hotel has marred the view. She stayed here for 13 days and in the film there are scenes directly in front and behind the Falls which all had to have the dialogue dubbed in back at the studio because of the noise of the raging water. It’s still a piece of precious movie history though, and we had a lovely champagne lunch in the Rainbow restaurant of the Crowne Plaza with a party of 180 Japanese tourists. 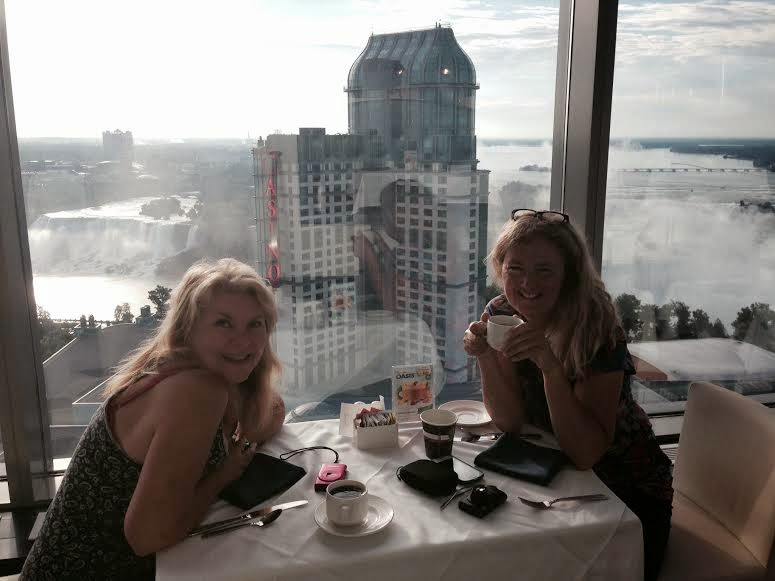 The view from here is still fabulous and takes in both the American and Canadian Falls. We watched Niagara the movie in its restored state in glorious Technicolour, and while the acting is a little on the ham side, there is some amazing footage of the Falls and Niagara itself and you can really see how much larger the Falls were then and how the town has changed. Personally, I think Niagara’s hey day is now. Everyone is still having a great time here and it remains a true natural wonder formed from glaciers Millennia ago. I just wish there was more made of the incredible history of the place before it all disappears under Casinos and Malls. Niagara still has the easy feel of a small town but it has a big place in the hearts of tourists from all over the globe. I have a feeling there’s still more to discover about this most spectacular border between two of the richest countries in the Western world.